Dentistry is a rapidly changing, expanding profession. The scope of a dentist’s work is much broader today than ever before, and continues to grow. Four year degree. This does not include the three years of university level studies required prior to admission to the program. You will learn to perform a wide variety of procedures and functions including prevention/public education, detection and management of oral conditions, esthetic improvement, restoration, correction, reconstruction and surgery. Oral Radiology, Orthodontics, Periodontics, Operative Dentistry, Pedodontics, Removable Prosthodontics, Fixed Prosthodontics, Health Science Interdisciplinary Relationships, Diagnosis/Oral Medicine, Endodontics, Advanced Oral and Maxillofacial Surgery, Implant Prosthodontics, Dental Practice Management, Comprehensive Care. The college is fully accredited by the Canadian Dental Association, and is recognized by the American Dental Association. Graduates who successfully complete the Doctor of Dental Medicine degree are eligible to take all North American board exams. 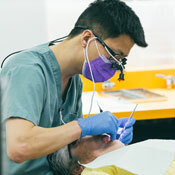 Early in the program, you will learn basic dental procedures and current techniques in a pre-clinical teaching area that includes a state-of-the-art clinic simulation facility. During the clinical training phase of the program, when you are a senior student, you will provide direct patient care through the Student Dental Clinic that accommodates over 10,000 visits every year. The small class size of 28 ensures you'll have attention from our team of approximately 22 full-time and 61 part-time faculty. Most dentistry graduates go into private practice but opportunities also exist in teaching and research, careers with government agencies or in industry. Academic dentistry - A career in academic dentistry career combines teaching, research, community service and patient care. Faculty members work in an intellectually stimulating academic environment. Public health dentistry - This career focuses on community settings rather than private practice. Promoting dental health, developing health policy and preventing disease are the major roles of a public health dentist. International health care - Dentists provide services to populations abroad and work for such agencies as the World Health Organization (WHO), the United Nations Educational, Scientific and Cultural Organization (UNESCO), and the Food and Agricultural Organization of the United Nations (FAO). Research - Research careers offer opportunities to contribute to advancements in dentistry that ultimately impact patient care. As a guideline, below are the estimated expenses for students registered in Year 1 of the D.M.D. program. Please note these are estimates only (2018-2019 rates) and subject to change from year to year. * - Out of province students will pay a differential tuition starting in 2019-2020. While you complete your Doctor of Dental Medicine, you can also earn a Bachelor of Science in Dentistry. This program option will give you the research skills to pursue graduate level education but will not interfere with your DMD program plan. Classes and your research project will be done over two summers. If you have already completed a dentistry degree from an academic institution not recognized by the Commission on Dental Accreditation of Canada (CDAC), you may be interested in our International Dental Degree Program, which will allow you to complete a Canadian Doctor of Dental Medicine in two years. Although we have staff available to assist applicants who seek counsel regarding admission to the College of Dentistry, it is the college’s policy not to instruct applicants as to a specific course of action they should follow, but rather provide the information needed for applicants to make their own choice with respect to the alternatives available. Admission is determined by the Admissions Committee on the basis of an annual competition. There is no provision for considering or accepting advance standing or transfer applicants. Applications from international students are no longer accepted. The College of Dentistry does NOT offer a qualifying program. Take Grade 12 Biology, Chemistry, Physics, and Math. Read through the Eligibility Requirements below to see what is needed to be considered for admission. In addition to completing the required pre-dentistry courses, applicants must be working towards an undergraduate degree and choose courses that meet the requirements of the degree. This will ensure alternate career choices if dentistry is no longer a viable option. It is recommended that applicants pursue a degree in the life sciences or health studies. The College of Dentistry will be changing the pre-dentistry courses required for the program for the 2020-2021 admissions cycle. Applicants will be required to complete NUTR 120.3 and BMSC 210.3 (or their equivalents) and PHYS 117.3/125.3 will no longer be a requirement. These changes DO NOT apply to applicants for the 2019-2020 admissions cycle. Applicants may schedule their pre-dentistry courses as they wish (i.e. in the summer) provided a 30-credit unit course load is maintained per academic year. All pre-dentistry course work must be completed by April of the year in which admission is being sought. If the pre-dentistry overall average is below 70%, students may improve their average by taking approved higher-level courses, which must be completed no later than the end of the previous academic year prior to application. Approved courses are higher-level courses that have the applicable pre-dentistry courses as a prerequisite. Applicants whose pre-dental education was completed outside of Saskatchewan are eligible for consideration provided they have completed the equivalent of the listed required pre-dentistry courses. View a list of course equivalents. A course syllabus which includes a course description, list of course topics, list of assessments, and required texts/readings may be required to determine equivalency. Completion of THREE (3) 30 credit-unit academic years of university level course work towards the requirements of an undergraduate degree. An academic year is defined as TWO standard academic terms consisting of eight (8) consecutive months (September – April). A cumulative weighted average of 75% over the TWO best academic years of study. Applicants must maintain BOTH of the following conditions for any course work during the year of application: a minimum overall academic average of at least 75% AND a minimum 70% average on any pre-requisite course. All applicants are required to take the Dental Aptitude Test (DAT) administered by the Canadian Dental Association. The Canadian DAT is offered twice per year (February and November). Results are valid for a period of three (3) years up to November of the year of application. Valid DAT scores for admission for 2019-2020 include the period of February 2016 to November 2018. If an applicant has taken the DAT more than once, the single best overall score will be used. All eligible applicants seeking admission are required to interview as part of the selection process. Interviews are granted based on the academic average of the applicant’s TWO best years and the best overall DAT score. Courses taken during the application year will NOT be included in academic average calculation. The interview is conducted using the multiple mini interview (MMI) format. The MMI exposes applicants to a series of stations each 10 minutes in length. Applicants are provided with a question at each station and given two minutes to read the question and prepare an answer. After two minutes, the applicant discusses their response with the interviewer for eight minutes before moving on to the next station. Self-declaration of an adult criminal record is required of all applicants on the application form. Applicants accepted into the program are required to complete and submit a Criminal Record Check with Vulnerable Sector Screening after the date of offer and no later than August 1. There are currently some Canadian provinces that will not license a dentist to practice if they have a criminal record. Applicants are encouraged to contact the respective provincial dental association for further information. Successful applicants must comply with the University of Saskatchewan’s policy on immunization, which states that all students attending a Health Science College must provide documented proof of immunization. Immunization records for accepted applicants must be received by the date stated in the letter of offer. It is the duty of the Admissions Committee to select applicants that have the ability to succeed in the program. The Admissions Committee reserves the right to review the applicant’s entire application submission, including all written/verbal communication with the College of Dentistry, and to deny entry to applicants whose academic background or history indicates a diminished probability of success. Applicants must meet the Eligibility Requirements listed above. In addition to completing the required pre-dentistry courses, applicants must be working towards an undergraduate degree and choose courses that meet the requirements of the degree. This will ensure alternate career choices if dentistry is no longer a viable option. It is recommended that applicants pursue a degree in the natural sciences. The full weighting of 65% is given to the cumulative weighted average of the TWO (2) best academic years of study. Each academic year must have no fewer than 30 credit units of university level course work. Applicants must have achieved a minimum cumulative weighted average of 75% over their TWO best academic years of study and must maintain an average of 75% in their current year of study. Courses taken during the application year will NOT be included in the academic average calculation. Applicants will not be considered if they have not met the minimum number of credit units or the minimum cumulative weighted average. Please note that a minimum cumulative weighted average of 75% does not guarantee admission. Applicants will not be considered if they have not met the minimum DAT requirements stated in the Eligibility Requirements listed above. A personal interview is required of all competitive applicants annually. Interview selection is based on academic average of the TWO best academic years of study and the single best overall DAT score. Interviews for admission for 2018-2019 are scheduled for Saturday, March 23, 2019. Applicants selected to interview will be contacted via email by early March. Applicants offered interviews should note that interviews are scheduled only once per year. Rescheduling, regardless of the reason, cannot be accommodated. Applicants not selected to interview will not be re-evaluated for final selection in the current year. Applicants may be disqualified from the admission competition for the year under consideration if their interview score is significantly below the mean of the current pool of applicants. Interview scores will not be released to applicants and specific feedback will not be provided. 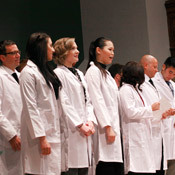 The College of Dentistry admits 34 students to the program each year. A minimum of 22 places are reserved for residents of Saskatchewan and up to 12 places for all other applicants regardless of residency. Applicants must designate their category on the online application form. All applicants must be Canadian citizens or landed immigrants at the time of application. To be eligible as a Saskatchewan resident, applicants must have resided in Saskatchewan for at least FOUR years immediately prior to September 1 of the year admission is being sought. For 2019-2020, applicants must have resided in Saskatchewan since September 1, 2015. Applicants who have left the province, but previously lived in Saskatchewan for an accumulated period of 15 years (permanent residency), will be considered residents. Applicants who have previously lived in Saskatchewan for an accumulated period of less than 15 years and who do not qualify under the four-year requirement will receive credit of one year toward the four-year requirement for every four years of residency in the province. There are NO EXCEPTIONS to the four-year Saskatchewan residency rule. Date of issue of your Saskatchewan Health Card1 AND either the date of issue of your Saskatchewan Drivers’ License2 OR Saskatchewan Income Tax Forms confirming taxes paid in Saskatchewan. Resident of the Yukon, Northwest or Nunavut Territories. 1. If the date of issue of your Saskatchewan Health Card is newer than the original date of issue, a letter from Saskatchewan Health confirming the date of issue is required. 2. If the date of issue of your Saskatchewan Drivers License is newer than the original date of issue, a Drivers Abstract is required. Applicants are required to complete courses equivalent to those listed for required pre-dentistry courses listed above. Equivalent course work will be evaluated based upon submission of official transcripts. Completion of 36 credit units of required pre-dentistry courses (or equivalents) with a minimum overall average of 70%. photographs of grandparents, parents, relatives, etc. Applicants must have earned a dental degree from a recognized dental school outside of Canada or the USA. Proof of degree and official transcripts must be provided. Applicants must meet the Saskatchewan residency rules as outlined above. If applicable, applicants must present satisfactory evidence of proficiency in English as stated above. Applicants must take the Canadian Dental Aptitude Test (DAT) administered by Canadian Dental Association and meet the minimum DAT requirements for all applicants as outlined above. Applicants must interview at the University of Saskatchewan for the year in which admission is being sought. Please note: Candidates may be disqualified from the admission competition for the year under consideration if their interview score is significantly below the mean of the current pool of candidates. Applicants must provide a one-page biography (curriculum vita) on the relevant dental experiences and other information that would be helpful to the Admissions Committee during the selection process. Applicants will be evaluated on all of the above criteria. Admission under the foreign trained dentist category is NOT guaranteed. The College of Dentistry may consider students with special circumstances with regard to any of the three 30-credit unit years of study, such that one or all years may have been completed over twelve (12) consecutive months as part of a program requirement. All ‘special case’ applicants will be considered by the Admissions Committee and they will compete with other applicants in the general pool of candidates. Special case applicants that have met ALL other requirements must submit a letter to support their application explaining their special circumstances. The College of Dentistry has no provision for special cases pertaining to the academic or residency requirements and letters will NOT be considered. There is no provision for accepting transfer students into the DMD program at this time. The College of Dentistry will no longer accept applications from international students. Deadline - The College of Dentistry accepts online applications only. The online application is available August 1 – January 15 each year. A non-refundable application fee in the amount of $170 CAD is required and MUST be paid online via credit card at the time the application is submitted. The application fee may be paid by Visa, MasterCard or Discover. Be sure to read the complete admissions guide before you begin your application. If you have any issues with the online application process, consult the application guide. Applications are not complete until ALL required documents are received. It is the applicant’s responsibility to ensure that all required documentation is received. Applicants can check the status of their application online by logging in to their application. Please ensure that the Admissions Office, College of Dentistry has a current address, telephone number, and email address. Please refer directly to specific policies when confirming required documentation. Applicants who previously or are currently attending the University of Saskatchewan are not required to submit official transcripts as their official record resides with this institution. Transcripts issued directly to students or photocopies are not acceptable. Final marks for all course work completed during the year of application, including all deferred examinations, MUST be reported on this transcript. If transcripts/documents are in a language other than English, submit an official notarized, word for word, English translation together with original documents. Calendars and/or course descriptions covering the completed courses must also be submitted. Previous applicants should know that transcripts are kept on file for up to 2 years. Updated transcripts must be requested if there is continued attendance at any institution since the last application. 3. Official DAT report of your best overall DAT score within the last 3 years (no older than February 2016 for the 2019-2020 application cycle). November 2018 DAT scores are due as soon as they become available. If re-applying for admission, DAT scores already submitted do not need to be re-submitted. Confirmation of enrolment if you are currently enrolled in any required pre-requisite courses in Term 1 of the year of application. If you are completing required prerequisite courses in Term 2 of the year of application, confirmation of enrolment must be submitted by February 1. Offers of interviews or rejection letters are sent from Dentistry in early April. If offered admission, arrange for 2 final and complete official transcripts due no later than June 5 (if the date occurs on a Saturday or Sunday, the deadline automatically becomes 4:30 p.m. the previous Friday). If currently registered, your final marks for Term 2, including any deferred examinations must be reported on this transcript. Interviews will be conducted at the end of March. Letters of offer/waitlist/rejection will be sent mid-April via email. Submit acceptance form, tuition deposit, immunization records and Criminal Record Check by deadlines stated in offer letter. Applicants offered admission must pay a non-refundable deposit of 15% of the tuition by the deadline date of the acceptance of the offer. Candidates who withdraw their admission acceptance after paying the fee will forfeit the 15% deposit. Payment of the deposit must be made by certified cheque, bank draft or money order and can be sent or delivered in person to the College of Dentistry, Office of Student Services, or, can be paid by MasterCard in-person at the Student Accounts & Treasury office, Room ADMIN E40. Criminal Record Checks with Vulnerable Sector Screening must be conducted AFTER the date of your letter of offer. Relax and enjoy the summer, attend Orientation held the Friday before classes. The Doctor of Dental Medicine (D.M.D.) 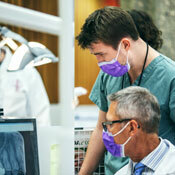 degree in dentistry is offered by the University of Saskatchewan's College of Dentistry. The College of Dentistry is a dynamic college with a reputation for excellence in both teaching and research. 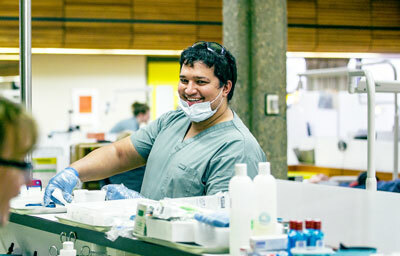 Established in 1965, the College of Dentistry was the first institution in the province of Saskatchewan to offer a fully accredited dental program. The college strives to serve as a leader in innovative scholarly pursuits, research, interdisciplinary collaboration, community outreach and engagement.